Every organization has workflows. A workflow is basically the sequence of events that takes place before work is completed. 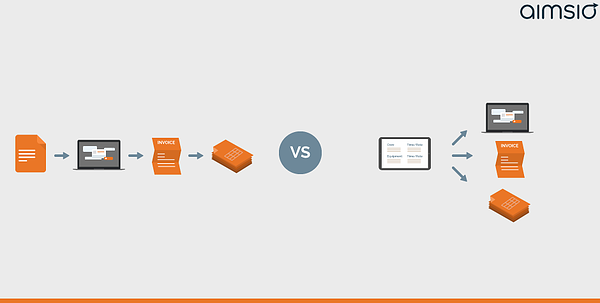 There are a million ways in which steps in a workflow can be combined. For the purpose of this article, we will be discussing the particular workflow from the moment data is first captured in the field to how that data is used to eventually pay employees. This article will provide best practices for data capture and how to optimize your workflow for maximum profitability. If you’d first like to learn what a workflow is and why you should invest in defining your workflows, check out this Workflows 101 article. Before we dive into the details, let’s get on the same page as to what operational data means. For the purpose of this article (and for many of our clients) operational data is the data captured in the field or on the job site. Typically, this is the number of hours worked by each employee or subcontractor, which equipment is dispatched to the job site, and the amount and type of materials used. We’ll refer to this data as LEM (Labour, Equipment, Material) from here on out. Now that we’ve defined operational data (aka LEM), let’s talk about best practices when capturing it. 1. 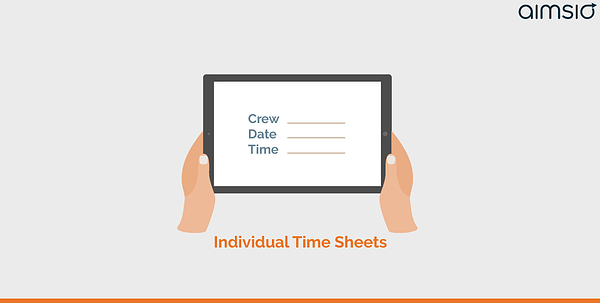 Individual time sheets: This is when every individual working on a job submits their own timesheet. This can be daily, weekly, biweekly, whatever. 2. Daily tickets: This is when the supervisor records everybody’s hours worked that day and compiles a report that includes all labour, equipment and hours worked (multiplied by the appropriate hourly rates). Why do we recommend daily tickets over individual time sheets? Simple. You see the whole picture. And perhaps more importantly, your clients will see the whole picture and can easily sign off on it. Another, more basic reason we recommend daily tickets over individual time sheets is because when you ask your crew to submit their hours at the end of the week, or worse, at the end of the job, the hours submitted won’t reflect the actual hours worked. Humans aren’t perfect. We don’t remember exactly when we started and stopped working each day. Make it simple and use daily tickets. As with any process change, you might have some objections, that’s why we’ve addressed some common objections below. Objection #1: "My field personnel visit multiple jobs in a day and it’s easier to get them to do their timesheet, which will be used later by the supervisor - usually after review and approval - to create a LEM based on all the time entries for the given job and day." Response: While it may seem easier, it’s ultimately inefficient in the overall picture. Why? First off, there is an extra review or approval process introduced, and secondly, it lacks a holistic view of a person’s hours worked in a day. For example, what if you cannot charge all of the hours one person has worked because the project went over budget? What about hours that can’t go under any job because the person worked 10 hours but the supervisor knows the client won’t accept anything over 5 hours? What if they submit more hours that they actually worked? Do you still pay them? Getting a supervisor to do daily LEM removes the extra approval process and ensures what you pay your field personnel is always accounted for. Objection #2: "But I pay field personnel $40 per hour while I pay my supervisor $150 per hour. Why would I want a supervisor doing the extra work when I’d have to pay them more? Field personnel should spend the time to record their hours because it costs me less." Response: Your $150 per hour supervisor still has to spend time reviewing hours. Somebody still needs to create the LEM out of time sheets and you might end up spending more hours overall to save an hour of your supervisor’s work. The math here is not as simple as you think. 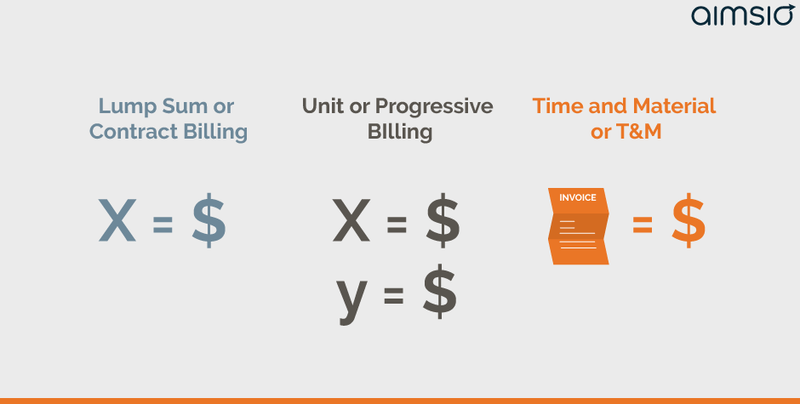 Best Practice #2: Know how you bill. And report on it. Lump Sum or Contract Billing: This is when your client tells you they’ll pay you $100,000 (or the agreed upon amount) when you deliver the final project. Unit or Progressive Billing: This is pretty much the same thing as Lump Sum or Contract billing, except there are agreed upon milestones such as $50,000 for phase one of the project and another $50,000 for phase two of the project. Time and Material or T&M: This is when you get paid based on your hourly rates. While this is common practice, it’s also an area where optimization is key. It can take a LONG time to create an invoice for clients if you’re still working on paper forms and tickets. Digitizing this area should be a major priority so you can get paid quicker. You can read more about that here. Ok, you may be wondering why we’re even bringing this up in an article that’s meant to be about capturing data not accounting practices. It’s all about profitability. And how capturing data eventually leads to insights about how profitable you are. The more information you have on your daily tickets, the more reporting you can do. Sure, maybe you completed a Lump Sum job in 100 hours. But if you’re not capturing individual hours, you don’t know how much money you’re making. Labour is typically the biggest component of job costing. So capture as much data as frequently as you can. Then, look at your billing structure. Did you take a Lump Sum job and complete it in 100 hours? Can you do it in 90 hours instead? If your LEM is captured in the field, on time, you can make these decisions on the fly. This one sounds obvious, but we include it because 89% of service companies are currently using manual processes for capturing field data. Many of you reading this might currently be capturing this data by using paper forms or tickets. Some of you could be using Excel. And many of you are probably using a combination of the two of them. This section is to get you thinking about what it will take to optimize your data capture workflow. For those of you using paper forms or tickets, think about this. Your current process probably looks something like this: Daily ticket is filled out and sent for approval. Depending on your structure, the approval likely happens by A/P, A/R, a Project Manager or some combination of the three. Each of those individuals is interested in looking at a certain piece of information on that daily ticket. A/P needs the data for payroll, A/R for accounting and the Project Manager for updating databases and spreadsheets. Once A/P looks at it, they take what they need, check a box and pass it along to A/R. A/R gets it, checks the box and passes it to the Project Manager who does the same. All of these steps happen consecutively, not simultaneously. 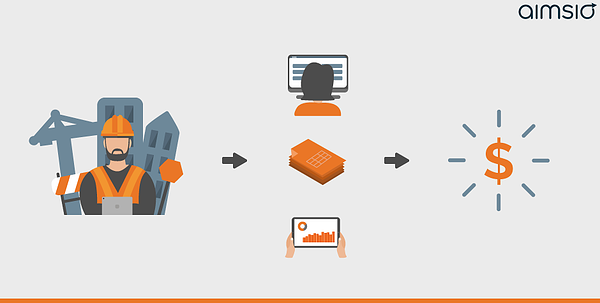 Think about the time you could save by taking it all digital and having this workflow happen simultaneously. And let’s not even talk about what happens if the Project Manager reviews the ticket after A/P and A/R and finds a mistake. Then the process has to start all over again from the beginning. Back to A/P we go. Finally, we recommend ditching the paper because doing math on the fly isn’t a perfect science. Rate sheets can be a real nuisance when you’re doing the math in your head, but they’re a real help when you use a software. Frank gets paid X amount per hour but Bill gets Y amount and Robert gets Z. You don’t need to to multiplication anymore. That’s what rate sheets are for. Look, we know this can be daunting. But that’s what we’re here for. Yes, we’re a software, but when you choose to go with us, you’ll get Aimsio team members scoping out your workflows and providing suggestions on how to optimize them. Then we create a solution that fits those workflows. Or as we like to say, “Come for the software, stay for our “give-a-sh*t” level”. We really give a sh*t about your workflows. And remember, when in doubt, look towards daily tickets.